Christmas is over and the household is put back to normal! Saturday our tree was untrimmed and out the door it went. I love the Holidays but I also love our house getting back to normal and look a little de-cluttered! We spent Friday opening gifts with my family and even Zoe got a gift from “Grandma” (I’m totally not that person but it’s funny to say!). 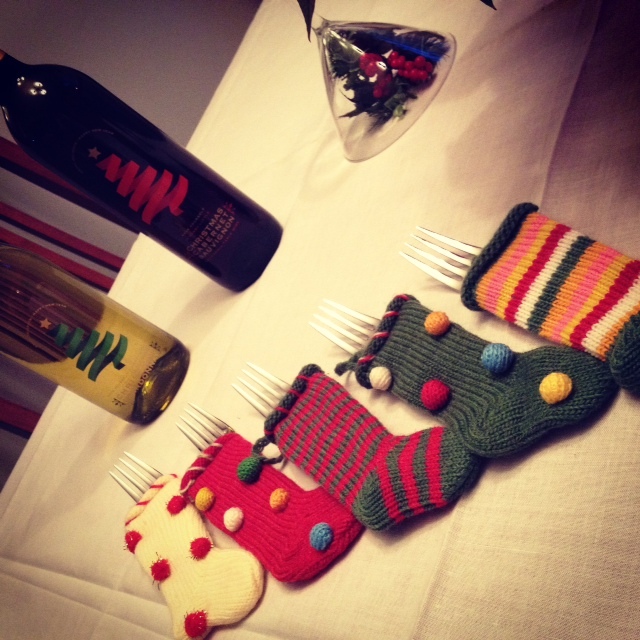 We had Stocking Stuffers galore packed with small food items, lotions and more. 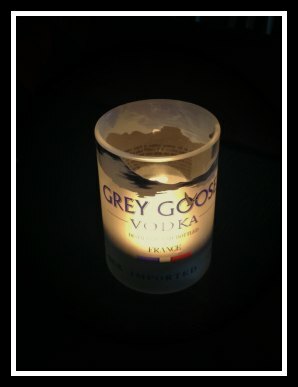 This super cute glass, Grey Goose glass was a winning item and today it was turned into a candle holder! So loving it! Cocktails, Cocktails and more Cocktails! 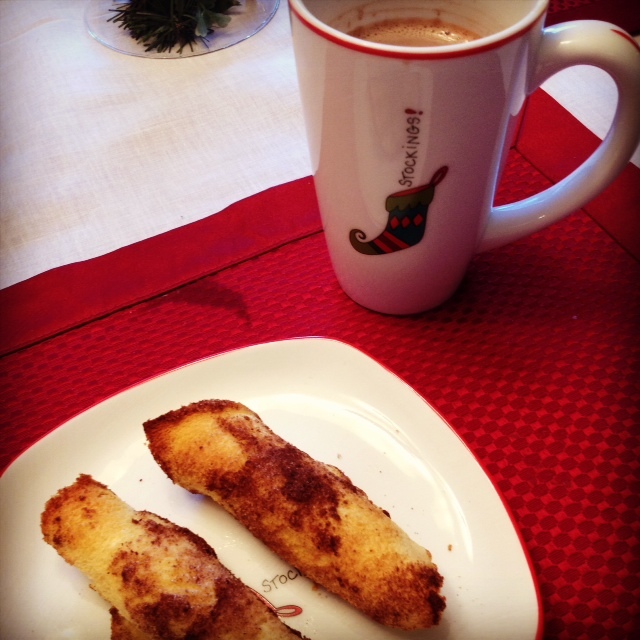 We aren’t heavy drinkers but do enjoy a treat before dinner. If you follow my Instagram, you already saw this Apple Pie Martini. 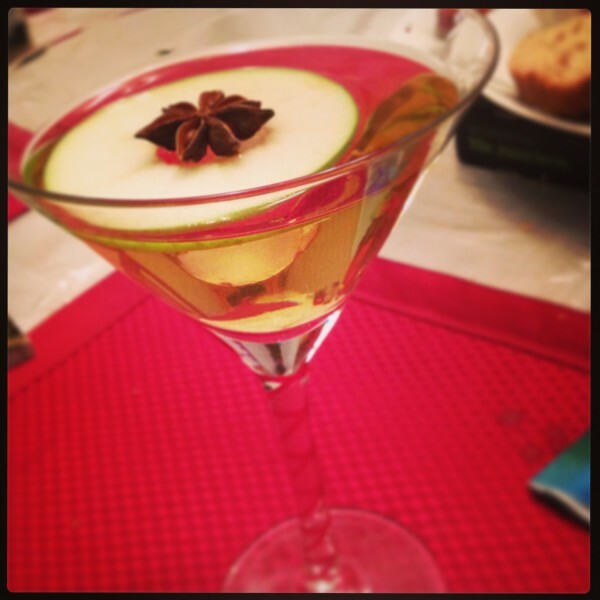 Vodka, Sparkling Cider with a dash or Allspice topped with a Granny Apple Slice and Star Anise. I think I made about 15 of these over two days. The yummiest martini I have ever had! We had so much food I think we all gained about 15 pounds! From the Breakfast Casserole, to the Leg of Lamb and Maid-Rites followed by Pigs in a Blanket – Sausage in French Toast style! 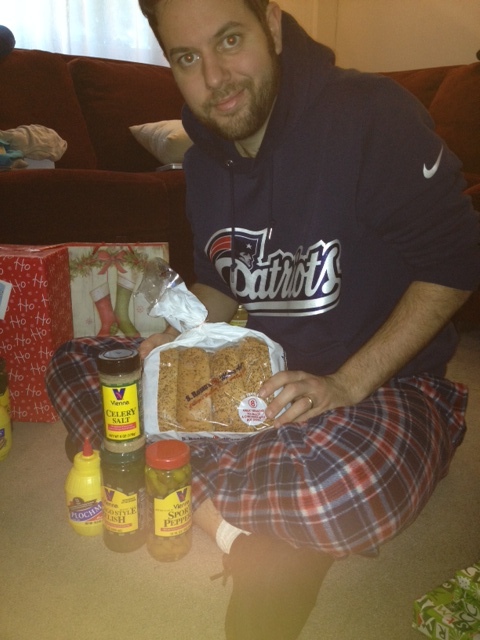 I absolutely love entertaining and trying new recipes – everything was a win win this Christmas. I loved having my parents and brother here for the long weekend, it is something different and makes waking up more exciting! Starting out the New Year, we will continue a healthy lifestyle. I try not to make resolutions because I don’t need the change of a date to make changes in my life. With surgery behind me (for good this time), a new four legged addition to our family and always looking for new ways to better our bodies, we are looking forward to an exciting 2014! Here is how I started my New Years Eve! An iced coffee with a water sidecar. 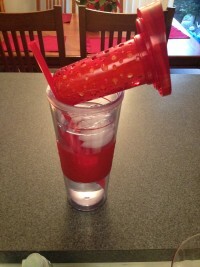 This new drink infuser cup was under the tree this year and I am loving it! Who actually likes drinking water? I try to as much as possible as difficult as it is. This new cup has a little infuser area so I can add whatever fruit flavors I want. On today’s menu, Clementines! After I feel water logged, I eat the yummy fruit! It’s a win-win for my health and taste buds! Goodbye 2013 and Welcome a fresh year with new memories! This entry was posted in Uncategorized on December 31, 2013 by Danielle Laroche. 4. More. Days. Until. Christmas! Unreal. 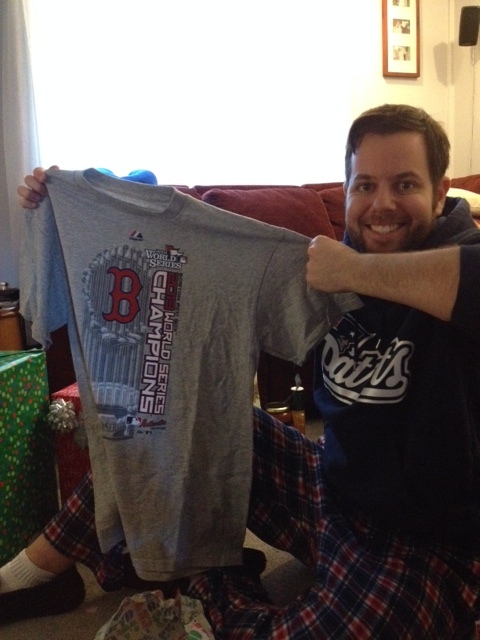 Saying December 20th seemed fine, but when I said 5 days until Christmas it puts it in perspective. Now we’re one day closer! AHH!! Boy is this a chaotic week…driving to Rhode Island for Christmas with Kevin’s family, then to Boston for yet another surgery (see why here), back to CT, Christmas at home with just the two of us, my brother comes on Christmas Day, I work on Thursday and then my family comes for the weekend! I’m exhausted just typing it. But I wouldn’t have it any other way! To help make this time of year easy, we want simple recipes, minimal cleanup and tasty food. Welcome to our caloric intake! 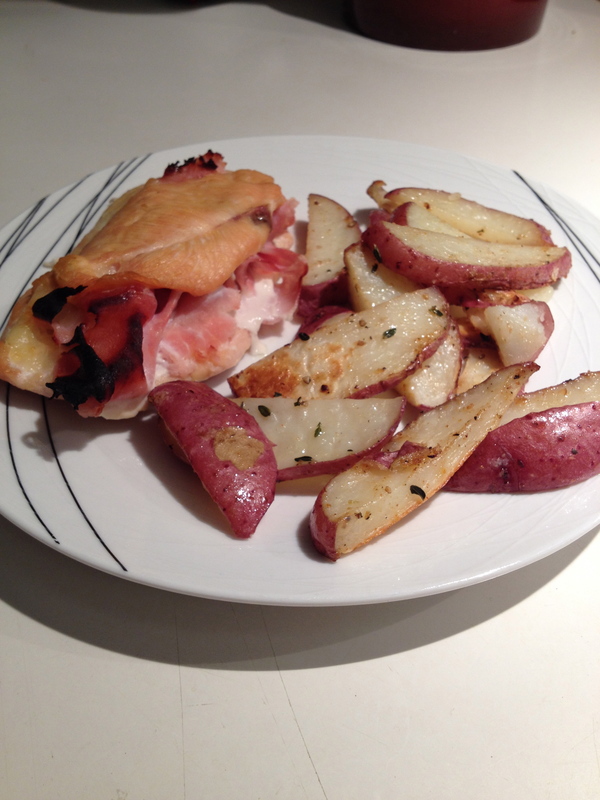 This week we made Chicken Cordon Bleu (not the breaded ones we typically think about in the frozen section of the grocery store) with Oven Roasted Potatoes. 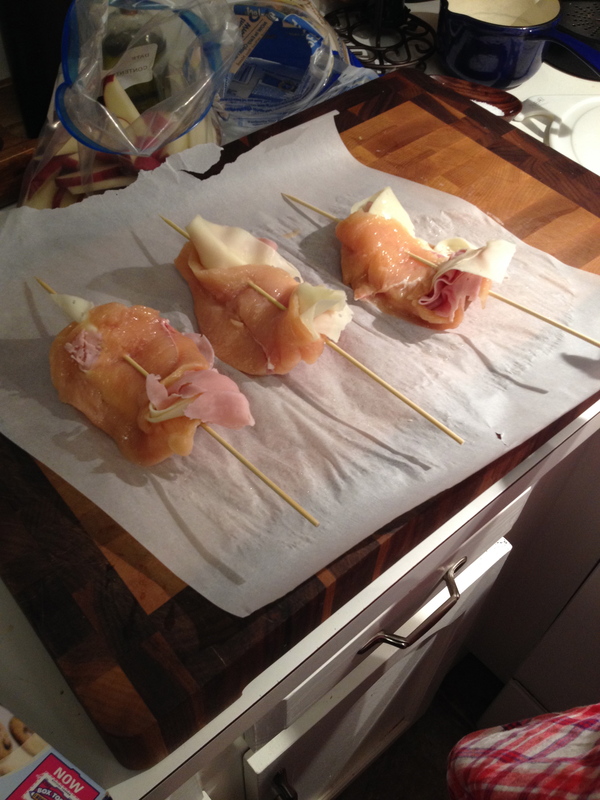 4 Chicken Breasts – pounded / 4-8 slices of Swiss Cheese / 4 slices Low Sodium Ham (we choose Boar’s Head) / toothpicks or skewers if your chicken is small. 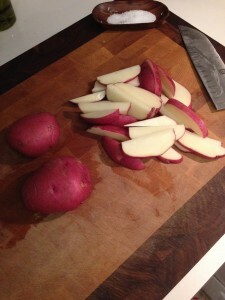 4 average size Potatoes (Yukon Gold is my choice but we only had red) / Olive Oil / Salt / Pepper / Paprika / Garlic Powder. Pound the chicken with a mallet (or heavy cast iron pan) between pieces of Wax Paper (or butterfly larger breasts). Lay 1-2 pieces of cheese on the chicken with some ham. Close the chicken and secure it with the toothpicks. Cook at 375 degrees for 45 minutes (my cheese oozed out this time because my breasts were tiny – story of my life). After you throw the chicken in, cut the potatoes any way you want – and throw in a Ziploc bag with the Olive Oil, Salt, Pepper, Paprika and Garlic Powder. Zip up and shake to coat all the pieces. Spread the potatoes on a baking sheet and bake for 35 minutes. DONE! I always use foil on my pans so I don’t have to scrub off the burned on food. Super easy and Super tasty! This is as French as my cooking gets. I hope you’re all enjoying the last few days before Christmas, I know I am! Please subscribe to get updates on my blog! Much Love. Every year I try to make some kind of homemade goodie for our friends and family. Whether it be something as a favor if we host the holiday or just a little treat for everyone…I don’t bake so this is the next best thing. In the past, I have done homemade Granola which has been a HUGE hit – I also made that as a favor for my Grandma’s 90th Birthday and everyone absolutely loved it. Another year I made (you’ve probably seen on Pinterest), the Pretzels with Hershey kiss and M&M on top. SUPER easy and the most delicious thing ever! For the Rehearsal Dinner before our wedding Kevin even made Hot Sauce to give to everyone that evening. It’s just a fun, unique touch to add to an event to make it a little more personal. Disclaimer – if you are a friend or family member that we exchange gifts with you may want to stop reading – otherwise the surprise will be ruined – unless you already saw my Instagram in which case – SPOILER ALERT no more. This year, I wanted to infuse my own Olive Oil. I had seen this a few months back and thought it would be a super fun, pretty inexpensive thing to do for everyone this season. I looked at a few separate “recipes” which isn’t even the right terminology, and found the right mix that I wanted to do. We decided on Rosemary and Thyme to be the stars of this event. Personally, I am not really a fan of those flavors, or Sage, Fennel, Rye…but they work well with Oil and for a dipping sauce for bread! When we do something new and creative like this…I tend to shop for the items, plan the event and Kevin basically executes it! 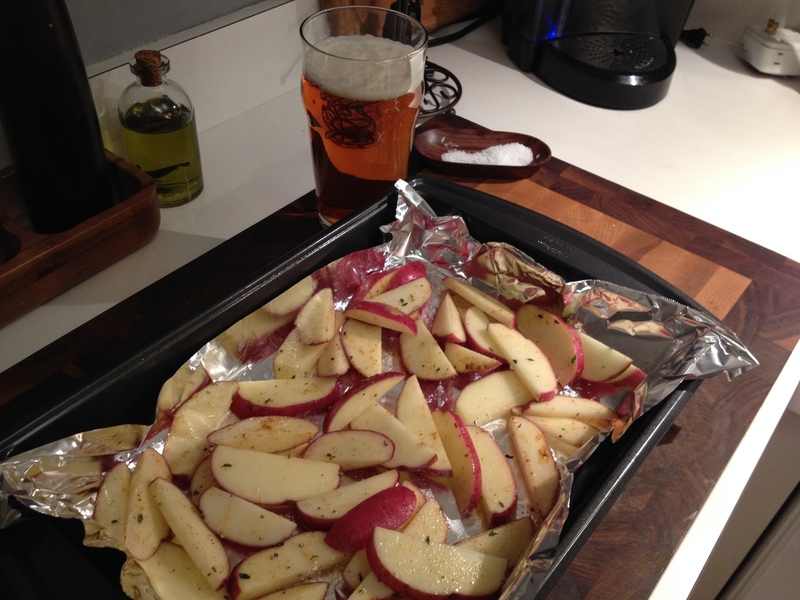 I missed the pictures of the beginning stages – BUT – we bought fresh Rosemary and Thyme which he put on a rack on top of a sheet pan and dried them in the oven – WOW what a delicious smell. He put them in around 150-170 degrees for about 10 minutes – but keep an eye on them so they don’t burn. He turned off the oven and left them in there to cool – overnight basically. In the meantime, he was making a spicy oil from homegrown Ghost Chili Peppers for his father and my brother since they thrive on spice! For this, he heated up half of the amount of oil and added the whole chili right to it. Let this cool, then brought to the appropriate volume with unused oil. 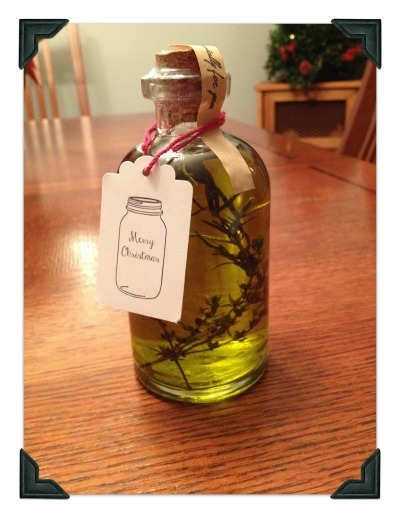 For the herb oils, we used 1-2 sprigs of each herb into each jar – if some pieces fall off, that’s ok! Then we topped off each jar with Olive Oil. 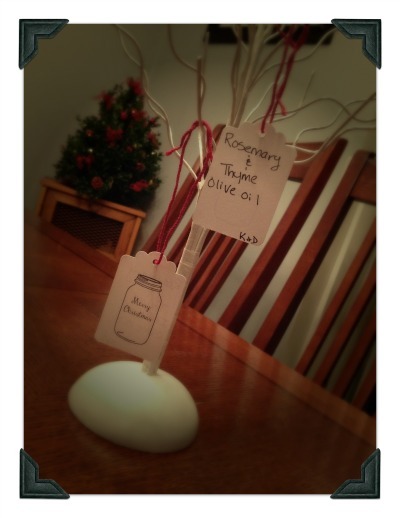 It’s important to use good Olive Oil – you don’t want to go cheap’o on this gift. We used Whole Foods 365 brand which is very good and a decent price for a 3L carton! I bought these jars from a random jar site online – I really can’t even guess on what the name of it was. But if you just search for Jars or Bottles you can find ANY size bottle. These were about $35 for 12 bottles, 250mL each (8oz). I used some seal-ons which we have at work, convenient, and the sticker at the top which says “Especially for you” I found on ETSY here. Lastly, I am LOVING these cute little tags which also came from ETSY, I have a slight obsession with Mason Jars so I definitely wanted that on the tag to make it seem more homemade and then just wrote on the back what it was. These came out super cute and I can’t contain myself. There you are, there’s my little homemade gift this season! Please comment and subscribe to my blog if you are enjoying what I do so I can keep doing what I love! This entry was posted in Uncategorized on December 18, 2013 by Danielle Laroche. First, I grab my husband and have him grate the soap (found in most grocery stores) – aside from being the soapy part of the detergent, it also helps give our clothes a fresher scent. 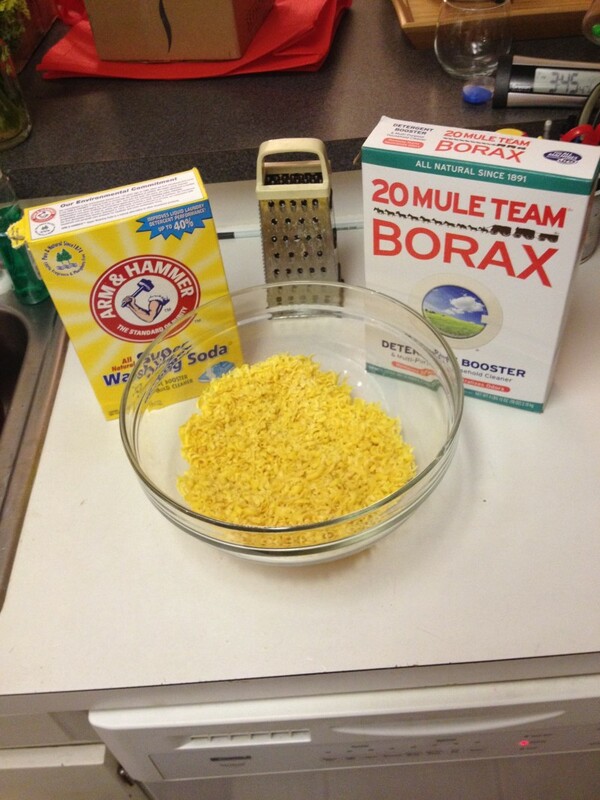 After he grates my two bars (which he does much fast than I can), we add in the Borax and Washing Soda (found in any grocery store). The boxes were close to being empty, so we literally did not measure. Throw it all together and store in an air tight container. 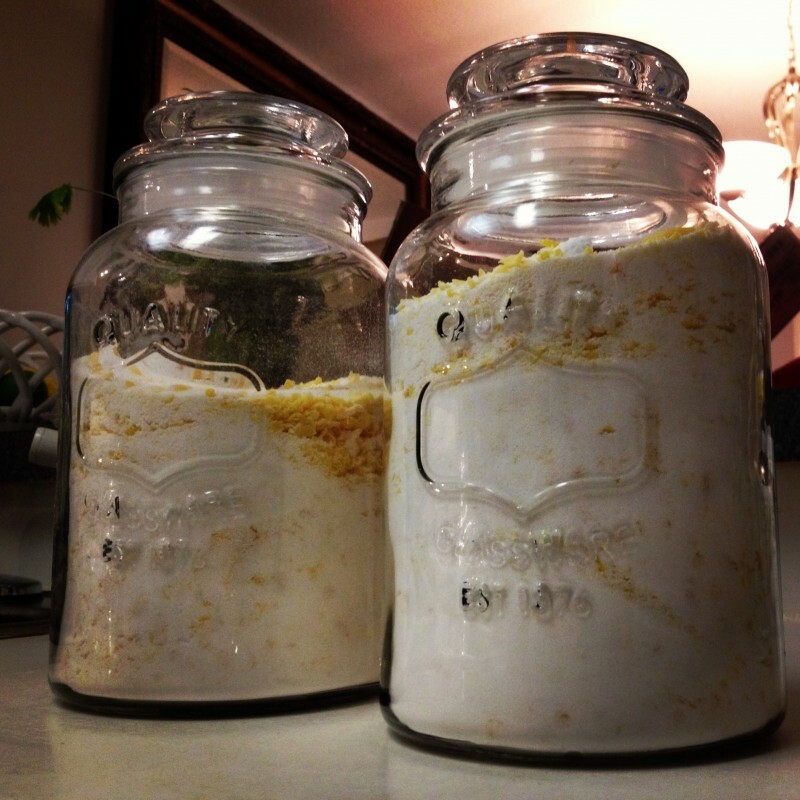 I happened to have some canisters with a rubber seal sitting around – usually I use large mason jars. I use about 1-2 scoops depending on the size of the load. Typically, I always wash on Super size load and about 2 scoops (the old school plastic coffee scoop). This will last hopefully 2-3 months at the rate I do laundry. 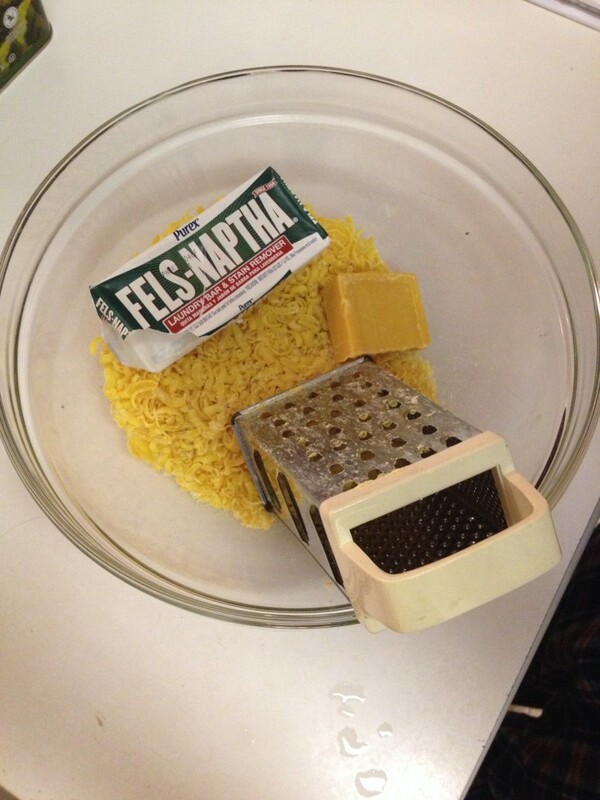 1 Bar of Fels Naptha – grated (1 bar / cup of Borax) – any natural/fresh soap can be used. The less added ingredients, the better. Scented oils can be added to give your clothes a better smell as opposed to “cleaning product”. We really like usually this, it’s cheaper and doesn’t clog up our washing machine – but it is much more potent than the watered down stuff you find in the store – try not to get it in contact with skin. After a day full of washing, drying and folding I was finally able to enjoy a little cocktail time! 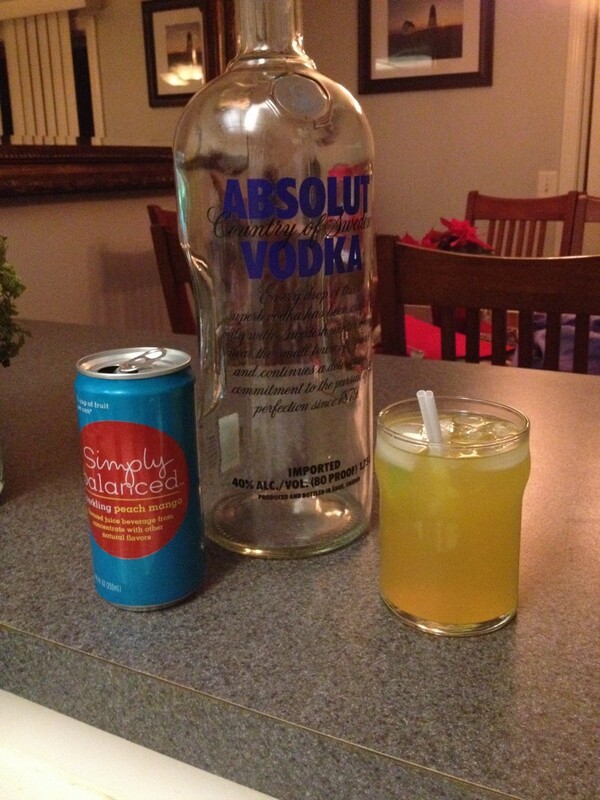 Super quick and easy drink of Vodka and Simply Balanced Sparkling Drink. Add some ice and enjoy! This entry was posted in Uncategorized on December 14, 2013 by Danielle Laroche. Some years I’m all into the holidays and some years I’m a bah-humbug and can’t find the ambition to decorate! I know, it’s awful. This year I feel too overwhelmed with things for some reason…but I still found the time to pull out some of my Christmas favorites and scatter them all throughout the house! It helps that my family is coming to our house to celebrate Christmas this year which gives me a reason to show off a little. I decided to try something new this year with our tree trimmings. I have bins and bins full of decorations I’ve gathered throughout my life and they tend to make our tree look cluttered. I went out to Target and bought these simple little beauties in Silver and Leaf Green – yeah slight green obsession. I also had some tiny white and red balls that I’ve had for years and snuck those in to fill out open spaces. Finished with white lights and a new Tree Star Topper and we’re good to go! Definitely needing a new tree skirt, but haven’t found one I adore yet…and if I like it, it’s way too much money for what it is. I plan to check out some after Christmas sales though. Did I mention Zoe decided she wanted to unwrap AND undecorate our tree yesterday? She’s so cute tho. Poor image quality. Sorry. Unfortunate truth about living in a condo is that we we don’t have a fireplace so we have to make due with what we do have. Luckily, there is a little ledge on our landing which is where most of the decorating takes place. 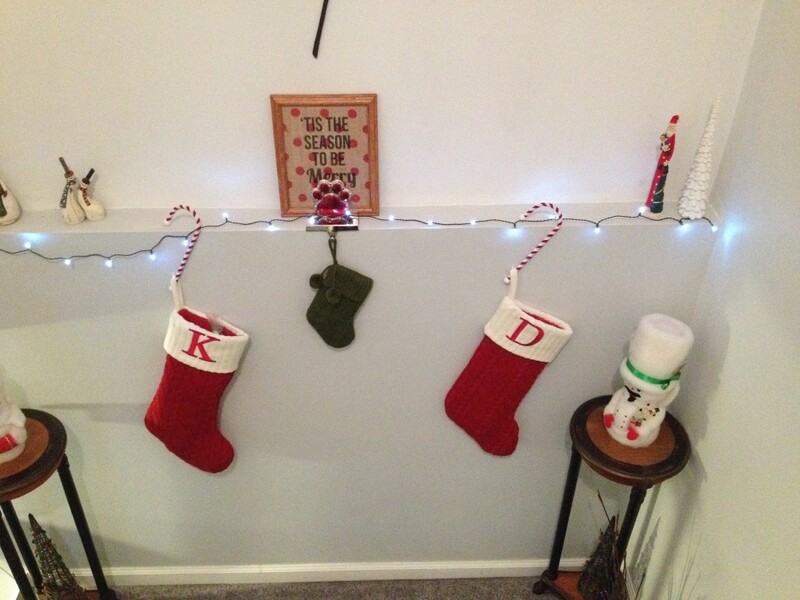 I changed some things up this year, got some new Stockings and one for Zoe, but there are no “Z” initials – sorry kid. My Mr. and Mrs. Clause were made by my Grandma many, many years ago and I cherish putting them out every year. It reminds me of her and brings me back to my childhood! 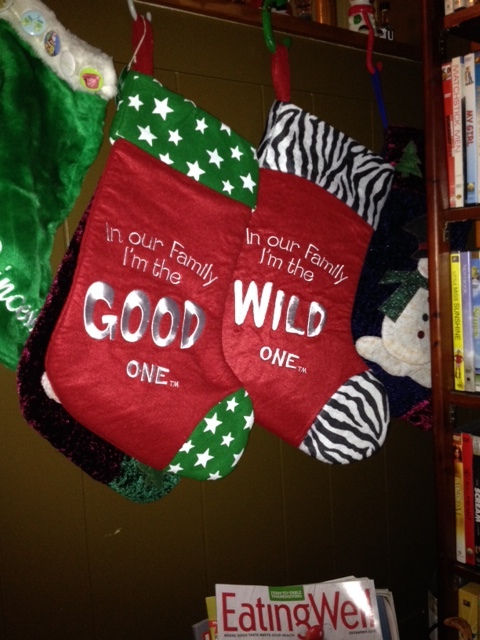 My new stocking holders came from Target but are no longer available…yes, because of me they are now sold out in the entire state! I am SO loving them now. I used to have the weighted ones but I got bored of those. 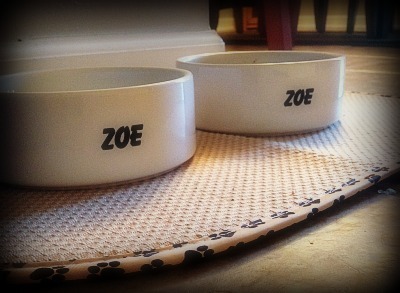 These are super cute and now we have extras for one day when there are more than just two of us! 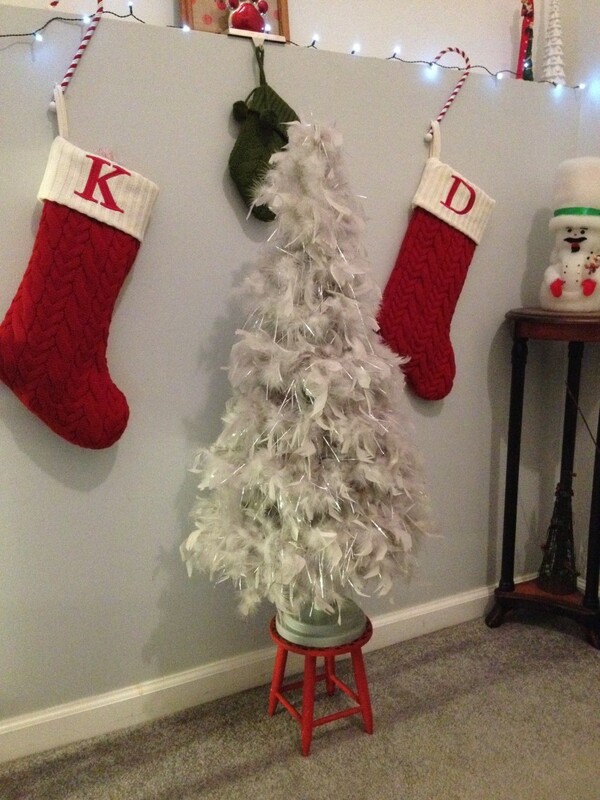 I ordered the feather tree online, RueLaLa, and I’m not sure I love it as much as I had hoped. At least the cat leaves it alone and it folds up flat for easy storage. 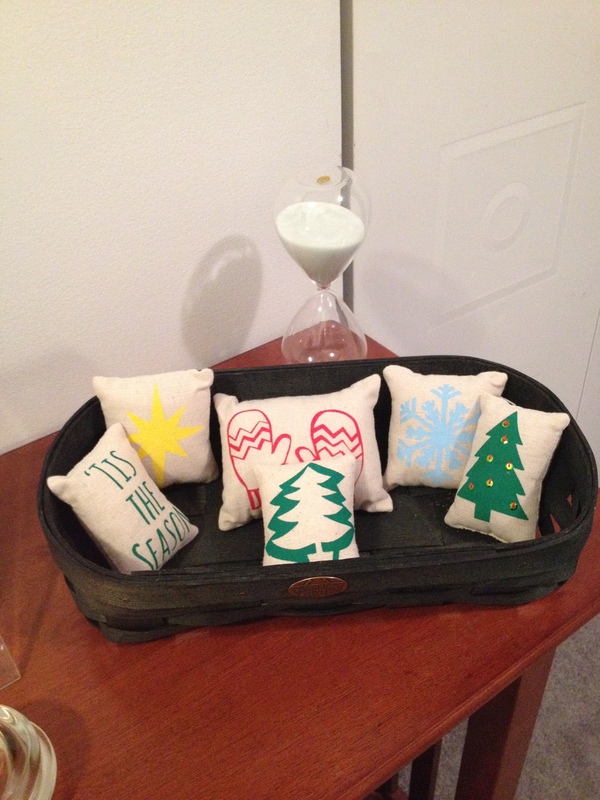 Last but not least, my “Tis the Season to be Merry” from my favorite Holiday movie of all time – it’s a Griswold Family Christmas…find others like it on ETSY at DolceAve and check out Megan’s blog over at hellonewlywedlife. Upstairs in our hallway is a little “couch table” which primarily holds our Wedding Pictures and the like. I got these little guys from BEtimeless over at ETSY and she was sweet enough to work with me to get Halloween and Thanksgiving ones with a coupon code. I LOVE them and think they add such a cute touch. 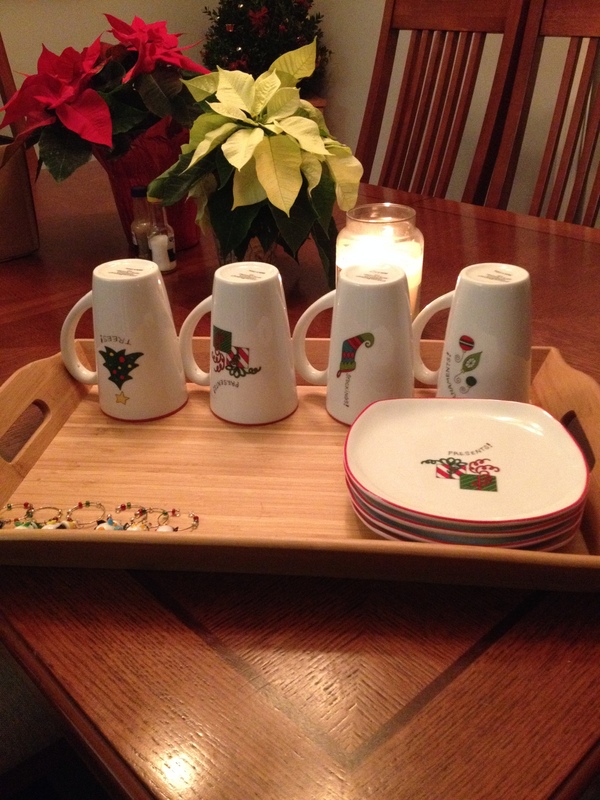 And to top off our Christmas Festivities, you can’t just drink tea and coffee out of everyday mugs or eat snacks off of normal plates, come on! I’m finally putting these little guys to use on my new mug rack! 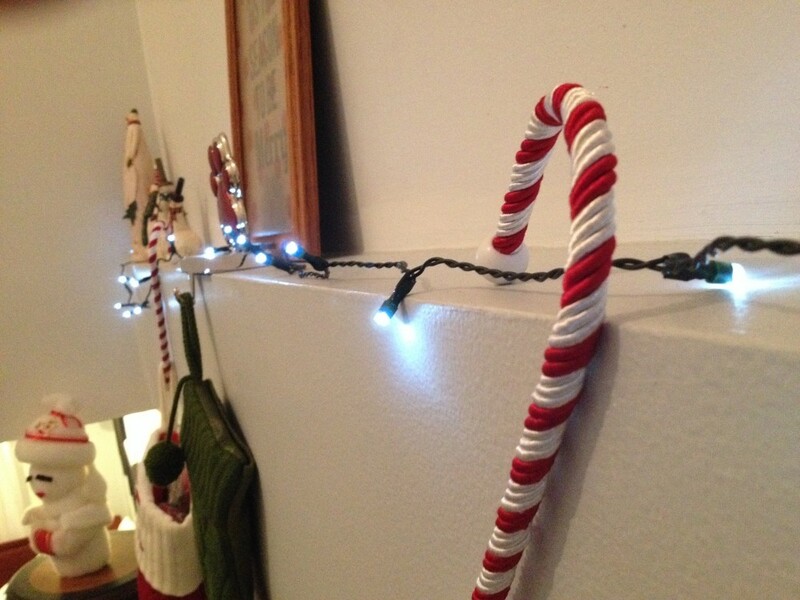 Happy Decorating! What does your house look like? This entry was posted in Uncategorized on December 12, 2013 by Danielle Laroche. I hope that you’re all enjoying December as much as I am. It’s such a great busy month and a lot of things need to get done before we can feel accomplished and kick back with a beer – or hot cocoa! 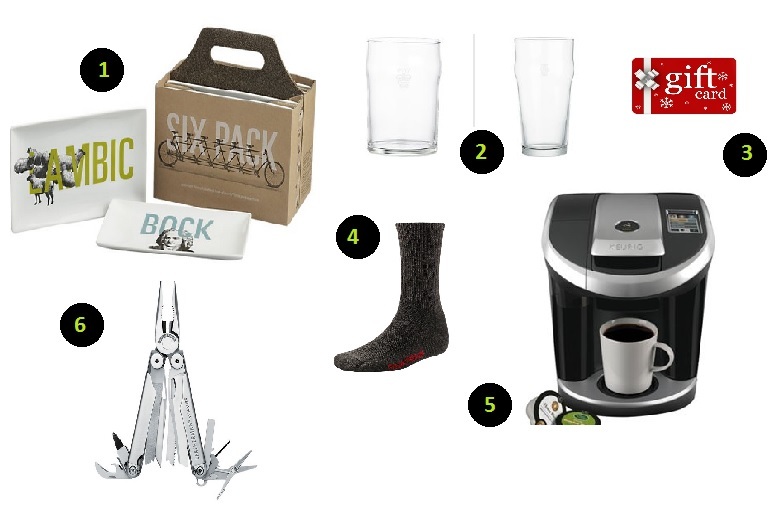 Here are my picks for the man in your life – it covers all grounds! 1- These Six Pack Plates are just the cutest toughest things I have seen and would be a great addition to the beer lover in your life – and the ladies won’t mind them much either. 2 – Crown Tumblers would pair nicely with a case of your man’s favorite beer. 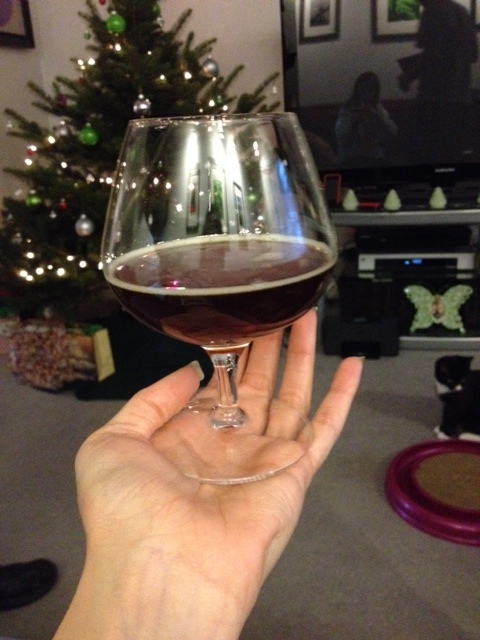 These are a little more old school – and a bit larger than the typical pint glass. The smaller ones are perfect for those of us that don’t need to drink a pool to feel quenched. 3 – Who doesn’t love a gift card? How about a gift card to your favorite restaurant, or a new restaurant you’ve been dying to try – you can pick up the rest of the tab to make it a true “from you” kind of gift. 4 – SmartWool Socks…Kevin swears by these socks. They have different weights to keep those toes warm and dry for any activity. I know they come with a hefty price tag for a pair of socks – your man will thank you. 5 – Keurig – The new Vue systems come with so many options what’s not to love? 6 – Multi-tools are a win win for any dude. The more accessories, the more he can use it for any task you need him to do. Added bonus – get it engraved to add that personal touch! I hope you’ve all enjoyed my monthly favorites! It’s so much fun planning gifts for the guys and getting a theme together. He doesn’t need more underwear or another tie. Make opening gifts worth while and not bank account draining! This entry was posted in Uncategorized on December 10, 2013 by Danielle Laroche. Here we are! Thanks for joining me over here at livinglarochelife! I’m so excited to be starting a new blog (and getting all the html kinks worked out!). I have so many things to share, from home decor, monthly favorites, exercise and fitness, cooking and more! Please keep checking back for updates and for a chance to start following me – once I figure out how to set that up! 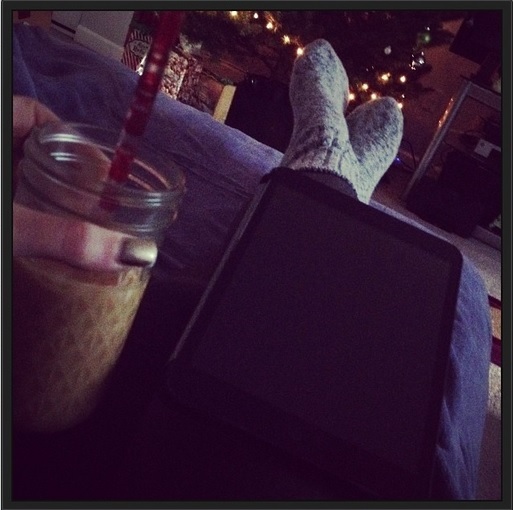 This was a busy weekend for me – it was my 29th birthday and the start of the Holiday season! Our tree is trimmed, with the help of our kitten! This entry was posted in Uncategorized on December 8, 2013 by Danielle Laroche.